After Ms. Hartman joined the security line and was screened by the T.S.A., she tried to board a flight to Connecticut around 2 p.m., attempting to conceal herself behind a passenger who was waiting in line, Ms. Simonton said. As Ms. Hartman tried to dart past the passenger, the gate agent stopped her, and directed her to sit down, Ms. Simonton said. Prosecutors said Ms. Hartman stayed overnight at the airport, and the next day she approached a shuttle bus headed for the international gate. “This shuttle requires a passport and plane ticket to board,” Ms. Simonton said, but despite having neither document, Ms. Hartman boarded the shuttle. According to the police, she then got on a flight that landed at Heathrow Airport in London, where she was detained by British customs officials and denied entry into the United Kingdom. When she arrived in the United States on Thursday, she was charged with one felony count of theft and one misdemeanor for trespassing. Ms. Hartman’s court-appointed lawyer could not be reached for comment on Sunday. At a hearing on Saturday, Judge Stephanie K. Miller ordered Ms. Hartman released on her own recognizance on the condition that she received psychiatric help, stayed away from O’Hare and British Airways and wore an ankle monitor until her case was concluded, The Chicago Tribune reported. Ms. Hartman was at the Cook County Jail because she did not have a place to stay in Cook County, which was a requirement for the electronic monitoring, Sophia Ansari, the press secretary for the Cook County Sheriff’s Office, said. 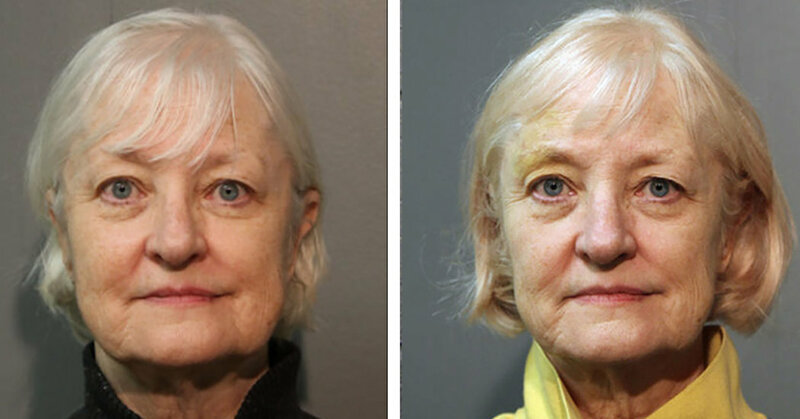 Ms. Hartman has been convicted of misdemeanors for criminal trespassing at O’Hare four times in recent years, Ms. Simonton said, but this is her first felony charge. In 2016, Parle Roe-Taylor, the assistant public defender representing Ms. Hartman in Chicago, spoke about her client’s “mental health issues,” saying that jail was not the appropriate place to deal with those problems. “But we do see it often and until we are able to devote the resources that are necessary for treatment — and it is a very expensive process — I think that we are going to continue to see more Marilyn Hartmans,” she said. In addition to her arrests in Illinois, Ms. Hartman has also been arrested in Arizona, California and Florida. During a 2016 hearing in Chicago, prosecutors said she had been stopped by the police on airport properties a dozen times in different parts of the country, The Chicago Sun-Times reported. Prosecutors in California in 2015 reported an even higher number, saying she had attempted to breach airport security at least 18 times, according to San Francisco magazine. Her episode last week was not the first time she stowed away on a plane. In 2014, she boarded a Southwest Airlines flight at the Mineta San Jose International Airport, in San Jose, Calif., without a ticket, and was arrested when she landed at the Los Angeles International Airport, KNTV reported. In 2015, she told investigators that she had boarded a plane in Minnesota without a ticket and flew to Jacksonville, Fla., according to an arrest report obtained by NBC News. That year she spoke to WMAQ, a television station in Chicago, and said it was time to stop trespassing. But in February 2016, despite wearing a device that tracked her movements, she went back to O’Hare, NBC News reported. She was arrested, and Judge William Raines ordered her to spend six months at a mental health treatment center. The T.S.A. is investigating the latest episode involving Ms. Hartman, it said in a statement. The Chicago Department of Aviation, which manages O’Hare, emphasized that Ms. Hartman was not a danger to others.